WebMan Design accessibility ready WordPress themes are built according to WordPress accessibility guidelines. This means that every theme that passes the guidelines receives an accessibility-ready tag and you are able to create a WCAG 2.0 level AA and Section 508 compliant websites with it. You can read more on theme accessibility in the theme documentation (such as Icelander documentation). You can check how the theme complies by testing its demo website with an accessibility evaluation testing tool (see below). Any automated tool might report issues. With theme demo websites they are related to demo content and you should modify those on your own live website anyway. You should double check the reported issues personally as your tool might not evaluate those accurately. Issues/alerts are not accessibility errors. The automated tools are handy for beginners to learn and understand web accessibility standards rather than to determine if a page is really compliant. Also, you might get false positives with some tools. Such as AChecker.ca continually reports missing label on WordPress native search form. This is because the label is associated implicitly, wrapped around the search input field instead. If you need to fix this, please use get_search_form() filter hook to modify the WordPress’ HTML. You can also read A warning about automated accessibility “warnings” article explaining similar situations. You can test a website for accessibility with various tools. WordPress recommends such tools at accessibility handbook page. You can read more information about some of those tools below. Easiest way to test accessibility is to run an online evaluation tool. One of the best (and WordPress.org recommended) ones is WebAIM WAVE. Just insert your website URL and go through the evaluation report. Another great simple tool to use is A11ygator which will list all the possible accessibility issues of the specific page with a brief explanation and proposed fix. Accessibility evaluation tools are also available in the form of browser extensions. For usage instructions please check the linked pages below. If you are using Google Chrome web browser, you can simply run inbuilt accessibility audit. The Accessibility Engine (aXe) is maybe a bit more complicated to use for beginners because it requires to open up your browser’s developer tools panel. You can follow step by step instructions on how to use aXe and just start using it. Chrome and Firefox browser extension for evaluating accessibility of specific page. Your website should be well structured with proper headings. 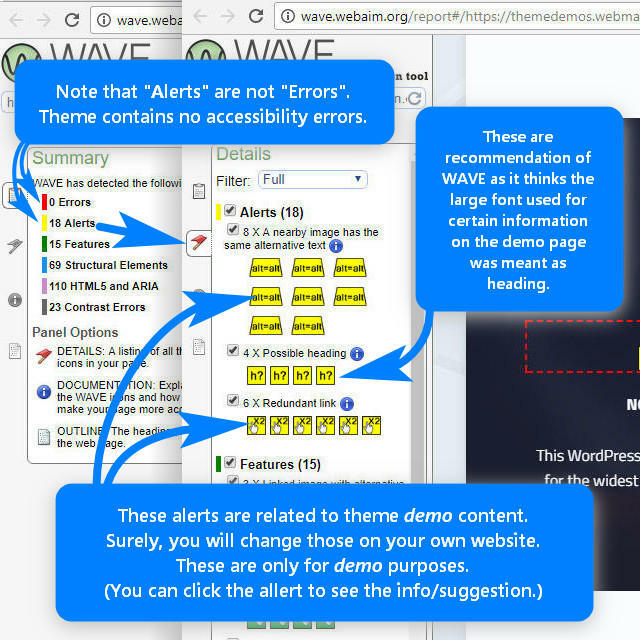 To test this accessibility requirement you can use a WebAIM WAVE (clicking on the “Outline” icon in the left column of report) or a dedicated Google Chrome or Mozilla Firefox web browser extension. Can you see where you are while navigating with the Tab key? Controls you navigate to with the Tab key receive focus, and there should always be a clear indication of where the focus is. Can you perform all the available actions on your website using only the keyboard? Any feature should be operable with keyboard only, from navigating to a new page or submitting a form, to the most complex ones. When building an accessible website, you will need to make your website content accessible too, as the content is the main part of any website. Having an accessibility ready theme is just a first step. But once you make your content accessible and you are using an accessibility ready WordPress theme, your website should be accessible according to WCAG 2.0 level AA and Section 508 requirements. Please understand that a theme demo website is really just a demo, and thus it may display some alerts with automated accessibility tests. But even with these demo websites, there are no accessibility errors.